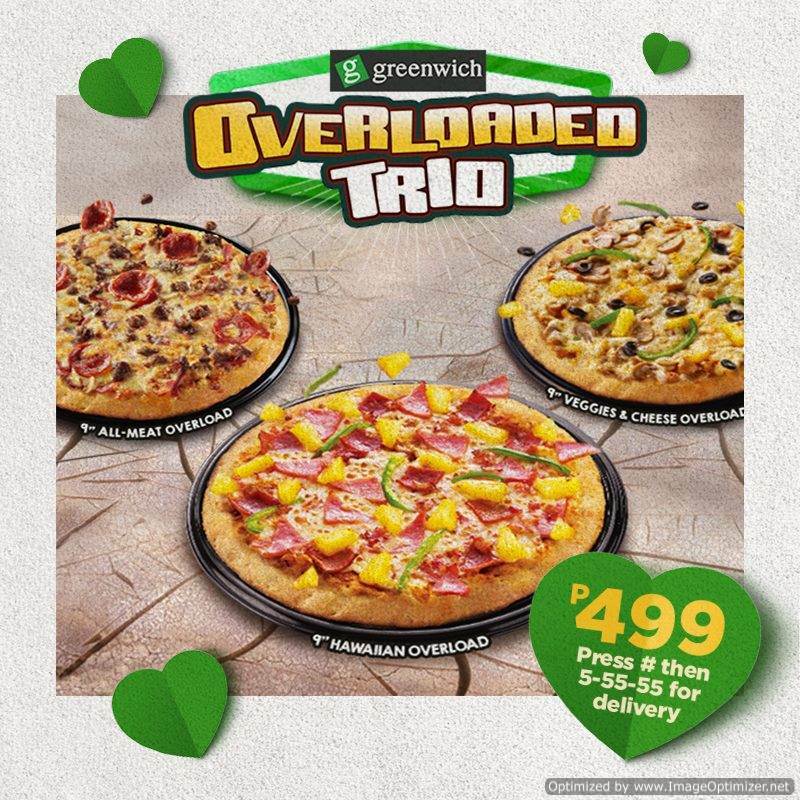 Experience an explosion of superior flavors from Greenwich Delivery Overload Trio! Thoughts of pizza dancing around in your head? Well now you can have 9-inch pizzas delivered at your doorsteps. Meet Greenwich Delivery Overload Trio– a triple treat that will triple the fun. Enjoy these thick crust pizza flavors and share it with your family or friends for only Php499. The promo is available for delivery only and until the Cheesy Steak and Fries Overload supplies last. The pizzas are double thick, 9″, with 6 slices each. Here are the ways to order. 2. Hotline – Press # then 5-55-55. 3. SMS – Text “G” to 0919-88-55555 or 0905-88-55555 and we’ll call you to take your order. Pizza flavors include the All-Meat, Veggies and Cheese, and Hawaiian. Grab this exclusive delivery offer by pressing # and dialing 5-55-55. You can also visit www.greenwichdelivery.com to place your order. They accept orders from 10:00 AM until 1:00 AM. 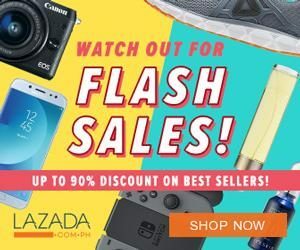 For promos and offers when you check out their official Facebook Page HERE. 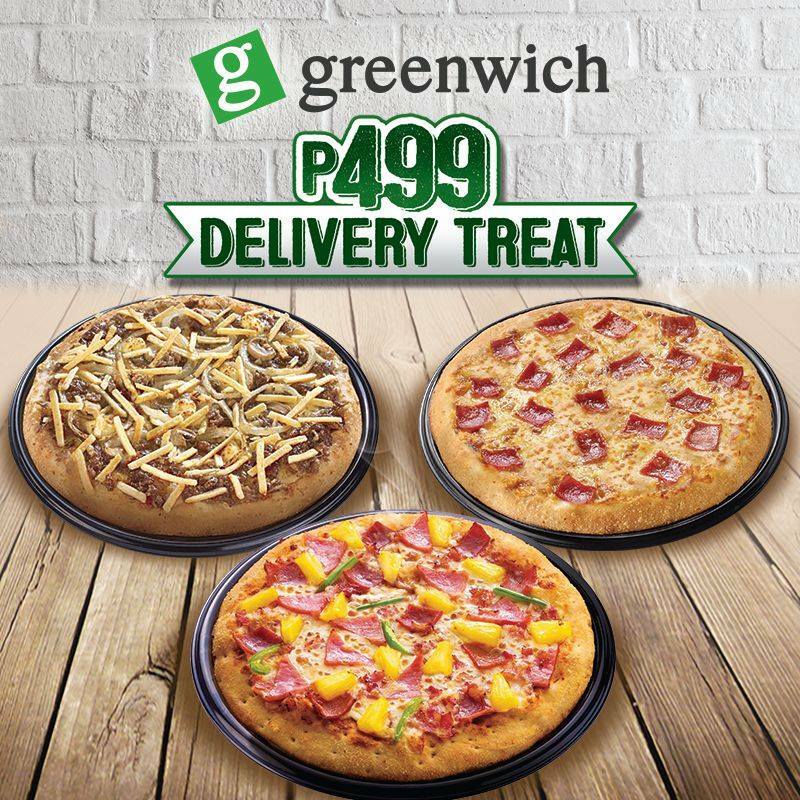 'greenwich promo' - 'greenwich promo 2019' - 'greenwich trio overload' - 'greenwich hawaiian overload price 2019' - 'greenwich menu 2018 promo' - 'greenwich pizza menu 2019' - 'greenwich pizza promo 2019' - 'Greenwich price 2019' -Enjoy!